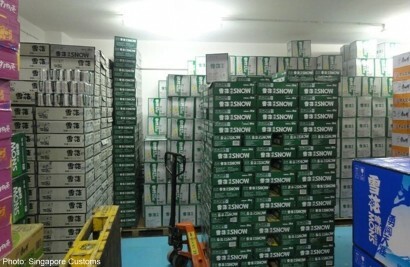 A former company director was fined more than $1.95 million and jailed three weeks for importing duty-unpaid beer and rice wine. Qi Shuai, 28, pleaded guilty to six charges of importing, possesssing and dealing in duty-unpaid beer and rice wine, said Singapore Customs in a statement today. The Singaporean, who was a director of wholesale trading company Tita Logistics Pte Ltd, also pleaded guilty to one charge of unauthorised breaking of a Singapore Customs seal. Six more charges were taken into consideration in the sentencing. The total duty and Goods and Services Tax (GST) evaded on the 28,406 bottles and 13,193 cans of duty-unpaid beer and 9,165 bottles of duty-unpaid rice wine exceeded $198,000. Singapore Customs began investigations into the company in May 2012. A container of goods imported by Qi, declared as soft drinks, instant noodles and vinegar, arrived at the Pasir Panjang Terminal on May 26, 2012 and was targeted by Singapore Customs officers for sealing to facilitate further checks on the goods. Two days later, when Qi did not apply for Customs supervision to unstuff the sealed container, Singapore Customs officers proceeded to his company for an on- site inspection. They found the Customs seal placed on the container broken and the goods in the container removed. The officers searched the company premises and seized a total of 15,780 bottles and 8,448 cans of duty-unpaid beer, and 1,500 bottles of duty-unpaid rice wine, which had been unloaded from the container. They also seized another 1,766 bottles and 4,025 cans of duty-unpaid beer and 120 bottles of duty-unpaid rice wine, as Qi could not produce documents to show that duty and GST for these goods had been paid. On June 5 2012, Singapore Customs officers checked another consignment of goods imported by Qi, which was declared as soft drinks, seasoning and seasoning wine. When the officers opened the container, 750 bottles of duty-unpaid rice wine were found instead.